"Black reflects the current state of rebelliousness and contentiousness in the world, but it also provides a feeling of privacy and protection." There was a time when black walls were mostly the purview of goth teens and indie movie theaters. But the color has been quietly cultivating a broader following among designers and homeowners who want a cozy, enveloping ambiance that’s still got theatrical flair. Bedrooms, libraries and bathrooms clad in inky or charcoal tones can be relaxing retreats. If you’ve got loads of windows, the color helps frame exterior views. And if the space is mostly walls, black creates a cocoon-like setting that can showcase a collection of objets d’art, vibrantly patterned rugs and furniture, or meditative warm woods and textures. Laboratory-white kitchens are also yielding ground to kitchens dressed in dark hues. 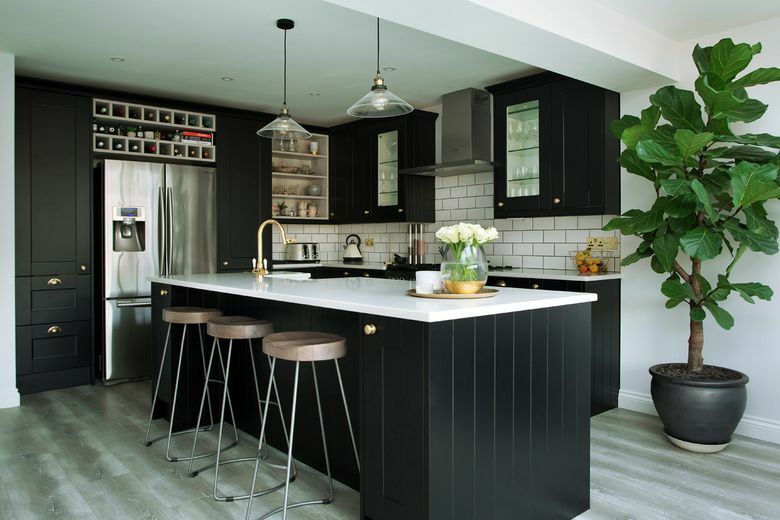 Houzz.com editor Mitchell Parker says black is having a moment in the cooking space. “Our community of homeowners is embracing a heavy dose of dramatic color with large swaths of black range hoods, island accent colors and full-on, all-black cabinetry,” he says. For a kitchen in Brentwood, California, Shannon Wollack and Brittany Zwickl of Studio Life.Style wanted to add a little more punch. “The kitchen’s all-black palette, infused with a large slab of black-and-white marble and bold brass accents, warms and fills the space without feeling too heavy,” says Wollack. LG, GE, Kitchenaid, Bosch, Frigidaire, Smeg, JennAir and others are offering suites of charcoal-black appliances with either a matte or satin smudge-proof finish. And there’s black cabinetry, countertop gadgets and cookery as well. Designer Mark Zeff and his wife, Kristen, have a home in East Hampton, New York, that celebrates black in several ways. The exterior is half-white, half-black. Inside, black serves as a narrative thread for large design elements including a floating fireplace, a stained pinewood wall in the master suite, and a glass wall in the shower. Punctuation is added with black cowhide rugs; curvy Bibendum chairs by Eileen Gray; and Eero Saarinen Womb chairs. “Black has properties that make it ideal for interior design: It’s calming to the eye, it’s elegant and it underscores organic beauty,” says Mark Zeff. Kristen Ekeland of Chicago-based Studio Gild also likes adding black, using Benjamin Moore’s Midnight in a recent bedroom project. “We wanted to create a space that’s calming and cozy. It’s dark, but it has an ethereal feeling,” she says. 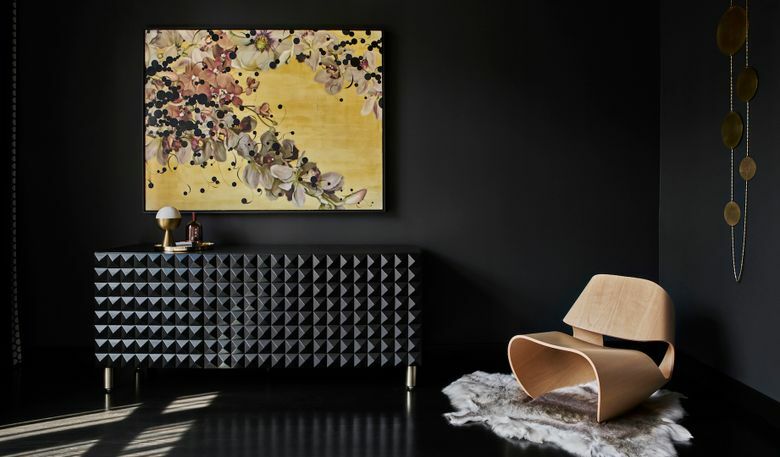 Along with the paint, the designers selected a black sideboard from Sabin to add depth and texture. Dee Schlotter, PPG’s senior color marketing manager, says using black on feature walls, interior surfaces and furniture serves as an anchor to neutrals, patterns and mixed materials, and provides a solid, classic element in any room while creating a sense of space and quiet. Her color team liked the hue so much that they chose Black Flame as PPG’s 2018 Color of the Year. Glidden picked Deep Onyx, another black, as theirs. “Black reflects the current state of rebelliousness and contentiousness in the world, but it also provides a feeling of privacy and protection,” says Schlotter.